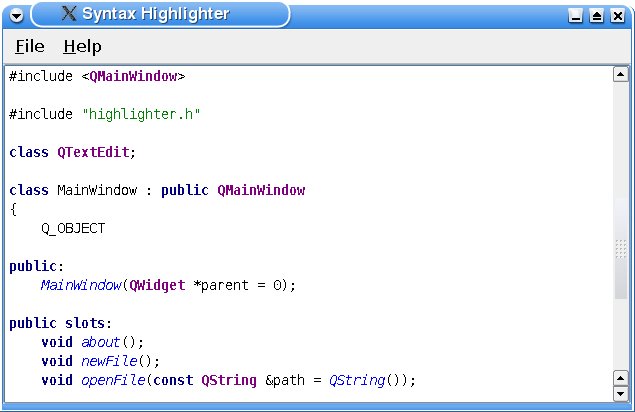 The Syntax Highlighter example shows how to perform simple syntax highlighting by subclassing the QSyntaxHighlighter class. We have chosen to store our highlighting rules using a private struct: A rule consists of a QRegExp pattern and a QTextCharFormat instance. The various rules are then stored using a QVector. First we apply the syntax highlighting rules that we stored in the highlightingRules vector. For each rule (i.e. for each HighlightingRule object) we search for the pattern in the given textblock using the QString::indexOf() function. When the first occurrence of the pattern is found, we use the QRegExp::matchedLength() function to determine the string that will be formatted. QRegExp::matchedLength() returns the length of the last matched string, or -1 if there was no match.